Mulling a third match with Hurd, Gallego says he's "energized about 2018"
Former U.S. Rep. Pete Gallego is considering another run for the U.S. House seat he lost to Republican Will Hurd. 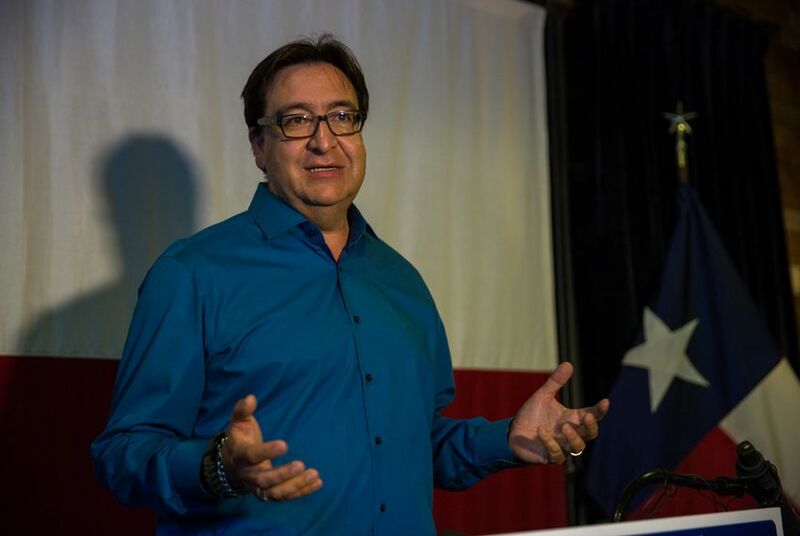 Less than a year after he lost his bid to reclaim his U.S. House seat, former U.S. Rep. Pete Gallego, D-Alpine, is seriously considering another run for Congress, citing shifting political winds in Texas' 23rd Congressional District following the election of President Donald Trump. A 2018 campaign would be Gallego's third against U.S. Rep. Will Hurd, R-Helotes, who unseated the one-term Gallego in 2014. Gallego then unsuccessfully challenged Hurd two years later, losing by 3,051 votes — an outcome Gallego believes would be much different if the election were held today. "It's certainly a different environment out there today than it was six months ago," Gallego said in an interview. "I have seen a lot of energy and enthusiasm in Democratic ranks — more than I've ever seen." "Frankly I'm energized about 2018," Gallego added. Gallego said he has not set a timeline for deciding whether to run, but his decision would not be tied to ongoing litigation over Texas' congressional district maps. The legal arguments over the maps, which were on trial last week, could lead to a more Democratic-friendly 23rd district, which stretches from San Antonio to El Paso and has long been the only competitive district in Texas. Hurd, himself, testified in the trial about his district on Saturday. "That litigation has been going on forever and what the ultimate outcome is — no really knows," Gallego said. "I certainly wouldn't be dependent on an outcome that may or may not come." Earlier this month, Gallego filed paperwork to form an exploratory committee for the seat, which he said gives him the "opportunity to travel the district and talk to people, see if they’re content with the status quo, see what they’re feeling and thinking." Trump was a major issue in the 2016 race, when Gallego went after Hurd for not speaking out forcefully enough against the GOP presidential nominee. Hurd, who never endorsed Trump, fully disavowed him amid the October fallout from the release of tapes that revealed Trump making lewd comments about women. In the interview, Gallego said Hurd would "like people to believe he's anti-Trump, but I think his voting record would show differently." For example, Gallego said, it's easy for Hurd to say he is against Trump's proposed border wall but questioned what "active steps" the incumbent has taken to make sure the wall is not built. "Will Hurd has been one of the most effective members of Congress since he defeated Pete in 2014," Hurd campaign manager Justin Hollis said in a statement. "The voters in this district voted for Will Hurd because he has a record of accomplishment, sending 11 pieces of legislation to the president's desk to be signed into law while Pete couldn't even get a bill out of committee. I just feel embarrassed for Pete at this point. Voters already told Gallego they didn't want a repeat of his do-nothing approach to public service, and a three-Pete is clearly something no one besides a career politician is interested in."